Gloucester captain Billy Twelvetrees kicked nine penalties to help his team to a 29-39 Aviva Premiership victory over Newcastle Falcons at Kingston Park. Twelvetrees kicked nine penalties and a conversion for a total of 29 points while Matt Kvesic and Charlie Sharples scored a try each. Whilst many fans had expected a close encounter the first half turned out to be anything but this. Gloucester skipper Twelvetrees was on form from the tee, kicking 17 points before half-time. The Cherry and Whites also ran in two tries from Matt Kvesic and Charlie Sharples. New Falcons fly-half Mike Delany kicked one penalty in a very lacklustre first 40 minutes for the home side. A much more resolute performance from the home side after the break saw them run in three tries from Simon Hammersley, Chris Harris and George Mcguigan, as well as nine points from Delany. Gloucester’s only points in the second-half came from the boot of Twelvetrees, who took his personal tally of the night to 29 with four penalties. Twelvetrees kicked two early penalties for Gloucester, with Newcastle’s ill discipline at the breakdown costing them. Ex-Crusaders man Delany then replied with three points for the Falcons, before Twelvetrees went on to add a further two penalties. 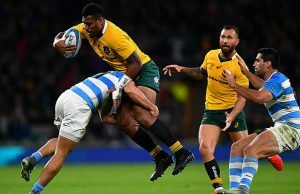 The first try came on 24 minutes, when new Gloucester scrum-half Willi Heinz went blindside from a ruck, popping the ball to Kvesic who went over in the corner. Gloucester’s second try came five minutes later, with a break from young centre Billy Meakes, who kept his composure to find Sharples and the England man crossed the line to extend the lead to 21. 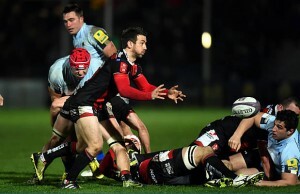 The Gloucester captain added a further penalty on 40 minutes to give the away side a 27-3 lead at the break. Twelvestrees started the second-half as he ended the first by slotting another three points. On 49 minutes, Newcastle full-back Hammersley broke through the Cherry and White line to go over under the posts. Delany then added a further penalty to reduce the gap to 17 points. After yet another Twelvetrees penalty, Newcastle ran in their second try of the half on 59 minutes after a break from Harris off of a sublime Delany offload. With Gloucester’s number 10 adding another three points, Dean Richards’ side responded with another try through McGuigan on 71 minutes. Twelvetrees rounded off the scoring with a final penalty on 72 minutes. Referee :Tom Foley (7th Premiership game). Assistant Referees: Andrew Small and Wayne Falla. Replacements: 16. George McGuigan, 17. Eric Fry, 18. Scott Wilson, 19. Josh Furno, 20. Ally Hogg, 21. Micky Young, 22. Craig Willis, 23. Tom Penny.